Where are animals spotted on campus? Help us out by hashtagging your photos with #AnimalOSU. 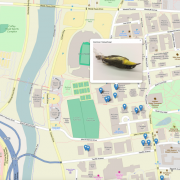 Your public Instagram photos will appear in the first map, if you have a location identified and you tag it with #AnimalOSU.